It's been a long long time since we in Australia have had a 5 day weekend. Anzac Day fell on the Monday that should have been Easter Monday and since Anzac Day cannot be moved, Tuesday was made Easter Monday and together with Good Friday, meant we all had 5 days off work. Yay! So what did I do with my 5 days? 1st of all I got stuck into my Afghanistan terrain project for the The Guild forum. See another post for an update on that one. 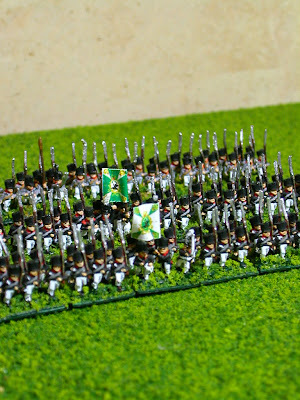 In amongst that, I finally got around to organising my 6mm Adler Prussians using the new 15mm base sizes for Empire. 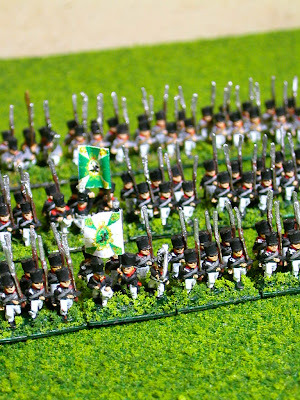 It meant that each base would contain 2 rows of 3 figures with 8 bases being the 4 companies or 8 "zugs" of a Prussian battalion. Multiply this all by 3 and we get a full regiment. 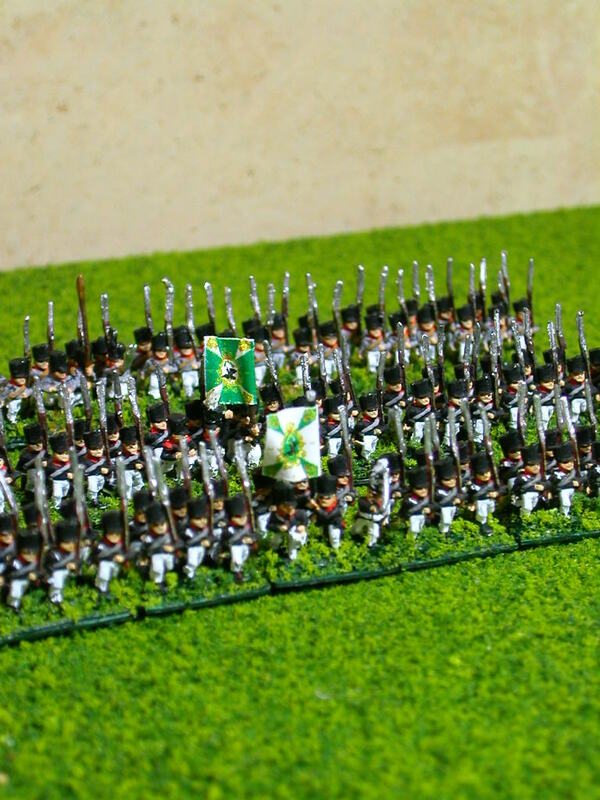 I decided on building the 1815 I Korps to begin with. It starts with the 12th Regiment of Infantry. Some quick research in books and online reveals this is one of the hardest regiments to find accurate info on. It appears to be a new regiment compiled from a bunch of different units in 1815. The uniform information is conflicting by the Waterloo book I have by Haythornwaite (Uniforms of Waterloo in Colour) says the 1st battalion had black jackets with red collar and white pants. It says the second battalion had black litewkas and nothing on the 3rd battalion. I also checked the French Waterloo website called http://www.mont-saint-jean.com/ and it shows black and white for the 1st battalion, the usual dark blue and grey for the 2nd and grey jacket and pants for the 3rd battalion. I decided on a mixture. 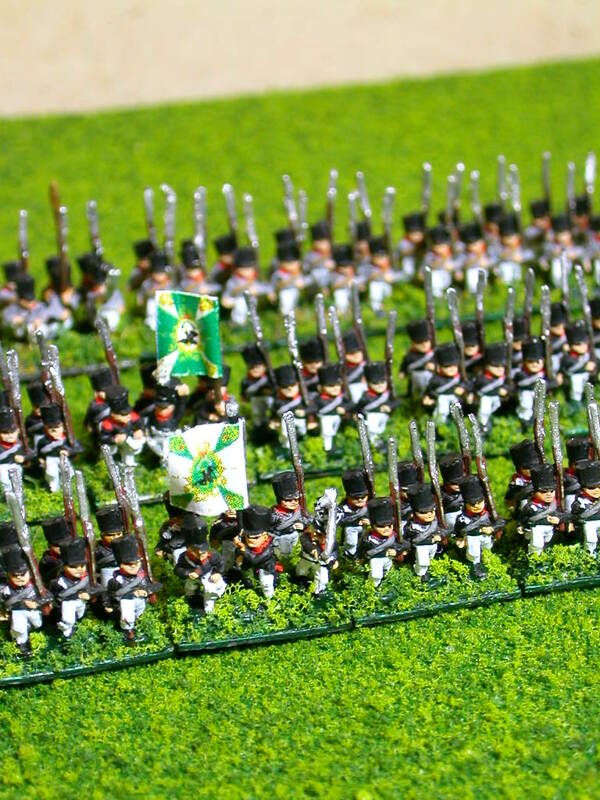 I would paint the 1st and 2nd battalions with a black jacket with red collar and white pants and the 3rd battalion with grey jacket with red collar and white pants. The hunt for flags was hard as well. The only reference I could find was for a pre 1806 flag for the 12th regiment. That would do. Moving on to the next regiment in that Corps, the 24th Regiment which was renamed from a reserve infantry regiment. This unit was all grey jackets with red collars and grey pants. Should not take too long.